Chosen by the Atlanta Falcons in the second round of the 1991 NFL draft, Favre saw scant action in Atlanta before being traded to Green Bay after one year. There was no question as to the young quarterback having outstanding tools, in particular a strong passing arm, but with new Head Coach Mike Holmgren looking to operate the West Coast offense, he was viewed as a raw talent with questionable maturity who would back up veteran Don Majkowski. However, Majkowski was injured early in the season and Favre nearly led the Packers to the postseason as he passed for 3227 yards and 18 TDs with a 64.1 completion percentage and was selected to the Pro Bowl. He also displayed toughness, playing the last seven games with a separated left shoulder. There were growing pains in ’93 as Favre, a natural improviser, bridled at Holmgren’s efforts at making him more disciplined. He led the NFL by throwing 24 interceptions, but Green Bay made it to the postseason and Favre was again named to the Pro Bowl. While he wasn’t selected in ’94, his numbers improved to 3882 yards passing with 33 TDs against 14 interceptions. In 1995 Favre led the league in passing yards (4413), TD passes (38), and TD percentage (6.7) and was not only selected to the Pro Bowl but was a consensus first-team All-NFL selection and received MVP recognition. He again received MVP, first-team All-NFL, and Pro Bowl honors in ’96 after once more leading the NFL in TD passes (a career-high 39) and TD percentage (7.2) and the Packers won the Super Bowl. Packers went 13-3 to finish first in the NFC Central while leading conference in scoring (422 points) and TDs (50). Won NFC Divisional playoff over Tampa Bay Buccaneers (21-7) and NFC Championship over San Francisco 49ers (23-10). Lost Super Bowl to Denver Broncos (31-24). 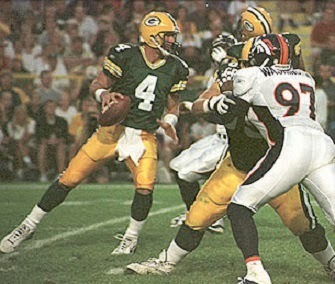 Favre led the NFL in pass completions (347), completion percentage (63.0), and passing yards (4212) in 1998, although the team’s fortunes began to fade. He played through many injuries over the ensuing years to put together a string of 297 consecutive starts that finally ended in 2010. Along the way he had six 4000-yard passing seasons and reached 3000 in 18 years. He also threw 30 or more TD passes nine times. After initially retiring from the Packers in 2007, Favre made a comeback that led to an acrimonious departure from Green Bay and he played with the New York Jets in 2008. A season that started promisingly with the Jets proved disappointing and Favre led the league by tossing 22 interceptions. Again calling it quits, he was lured back by the Minnesota Vikings, finishing up with two seasons there. Overall, Favre left as the all-time NFL leader in pass attempts (10,169), completions (6300), yards (71,838), TD passes (508), and, on the downside, interceptions (336).